Friday, June 30th 9:00 a.m.
through Saturday, July 1st 8:30 a.m.
not watch one hour with me?” Matthew 26:40. Adorers are needed again for our nocturnal adoration. Please consider spending an hour with our Lord and sign up on one of the posters at either entrance or fill out the small forms next to the posters and return to the Rectory. 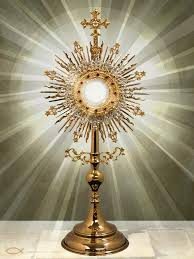 Thank you to all who signed up and participated in Eucharistic Adoration for the month of June! If you can do those same hours or different ones for July, please fill in your information again on the signs at the entrances to the church.